Are we ever going to get our ratings and want to see lists back? I had YEARS of ratings in this app and also used it to track what I'd like to see and they obliterated it with an update without any warning or a way to export your data first. What a horrible way to treat your users. I've been patiently waiting for them to reinstate the data like they claim but it's been months and nothing has changed. The app is mostly useless and at this point I'll just use IMDB instead. Thanks for nothing, Flixster. It won’t let you login unless you have a Facebook account. The changes made to the app recently are disappointing. It’s a lot of flash and far less substance. 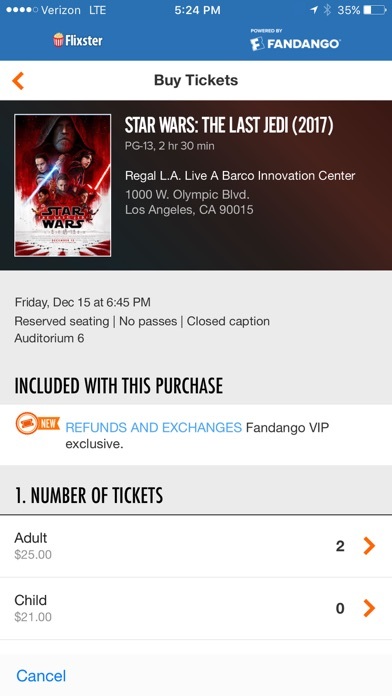 They’ve even decreased the usability by outright hiding movie theaters (by default) that don’t use Fandango for ticketing (it’s possible to show them, but the setting is buried and hidden). What the heck happened? Was the best movie App and source of movie content hands down then someone changed it. What were you thinking? Please take it back the way it was this is not an upgrade! I don't know what they did to the app, but it's far worse than it used to be. The theaters that I had marked as my favorites are all gone. 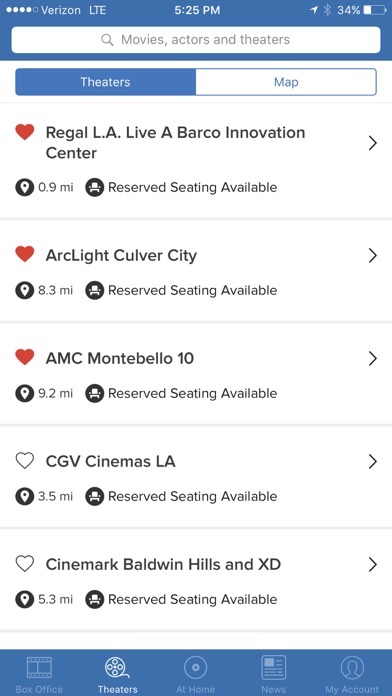 Not all the theaters near me show up on the map or list; I have to search for them to find them. Many independent theaters are no longer listed. I assume they changed their policies or pricing in some way so that some theaters dropped out. For me, it's now useless. This app WAS great and helpful, now you can’t even sign in with google anymore, there goes my watch list .... it is much harder to navigate and doesn’t give much info anymore; seems more tailored to be like fandango and just an app to buy movie tickets .. I use to really love this app until it upgraded. Ever since it upgraded you can’t see half as many dvds that are coming out. I always loved being able to see when a dvd would be released now they only show a few handful and ones no one real has ever heard of. I wish they would go back to their old lay out because this is not working for me anymore. All of the movie hundreds of ratings I had made were wiped out in the last app update. It doesn’t recognize me anymore and wants a new login. It also doesn’t allow you to write a review of anything. 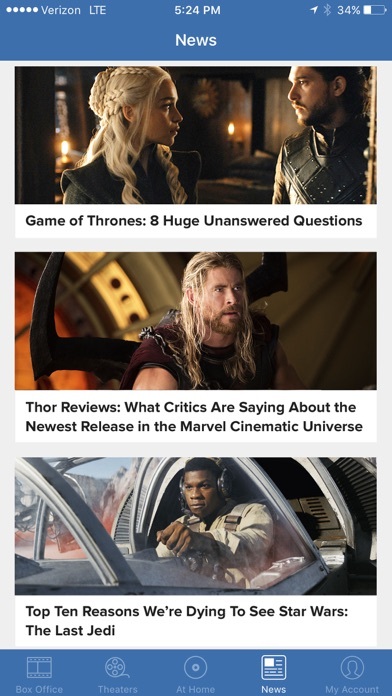 Flixster was my go-to app for finding out information on recent movies, but I have agree with many here that this change just emphasizes what many people hate about Rotten Tomato scores--there's no nuanced reviews and now you can't even read entire reviews anymore. Please fix this. Please bring back the older version! Redesign is a case study of poor design. No complete filmography, search capability is terrible. Used to be a great app, I may have to delete now. This app used to my go to for renting movies. It won’t let me scroll down. It used to be listed my date of dvd release, which made it easy. I can’t see anymore future releases. I can’t see my want to see list. Absolutely horrible. Deleted this app after last update (Jan 2018). Can’t find movie descriptions anymore. It also left the closest major theater off the list. Got IMDB instead. The new update has almost no movies to review on dvd. It’s like ten recent releases and that’s it. It used to just be a chronological running scroll which was great. I’m not any more likely to rent a movie because it’s on here anymore. I’m just going to stop using that function now. This was once the best movie finding app out there. Now it’s worthless. Search for anything and you get no responses. Pretty disappointed. Maybe they’ll go back and stop messing with a good thing (though I doubt it). Ever since they updated this app I hate it! I used to use it when picking out DVDs to buy. Now I cannot find Release Dates anymore! It is frustrating because I now have to type in the search to find information and ratings on a dvd movie. It used to be easy! All new releases were listed by the dates. Why did you remove the dates? Please bring back the old app! I miss and now forced to find another one that will work for me! New update is terrible! Can't find half the shows I search for. Bring back the old version, please!!! Used to see Netflix movies and ratings. I deleted this miserable thing. They are not to be found. I was not able to submit my review. Get it fixed. This app is genius. I live in Tampa and have like 10 theaters within a couple miles of me. 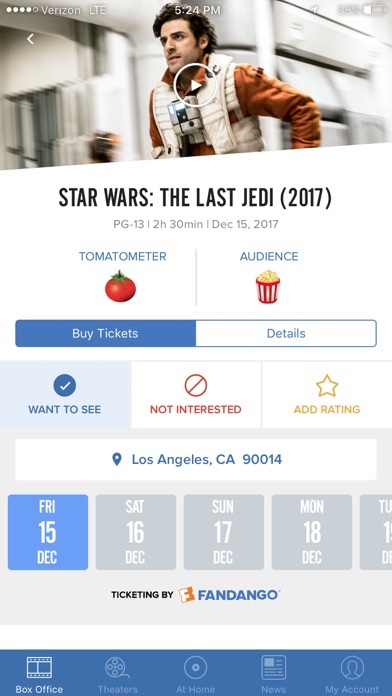 This app is an easy way to see exactly what times and what movies are playing at every theatre within a matter of seconds. You can search by a specific movie you are looking for or by closest theatre. I use this every time I wanna go to the movies. They updated and now I see the app as totally pointless. This use to be one of my main apps that I’d always use to look up movies I wanna see or just look at all the movies an actor has been in. I’m pretty disappointed and deleted it out of anger. Maybe they’ll smarten up and reverse the damage they’ve done. (Used to be a) Great app! I use it, literally, all the time. But it does crash a little more often than It probably should. UPDATE 1/11/18 This was my go to app for finding the most recent reviews, showtimes and theater listings. I gave this newest update a chance, thinking maybe I’m just reacting to something suddenly different but truly this newest update is all flash and no substance. It’s the least functional update I can imagine. Really hoping they fix this! Please! Someone had an off day and sent the wrong update or something? Used to be my "go to" app. Now I am on the edge of deleting it. I don't because I keep thinking they are going to fix it. 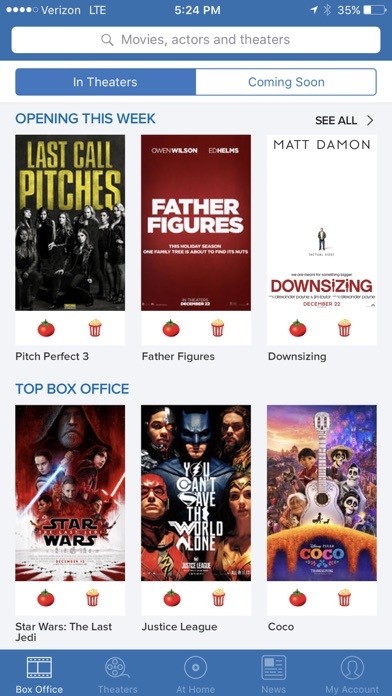 I relied on Flixster daily for years for info on current films and screenings scheduled; streaming films and available services; and the invaluable integration with Rotten Tomatoes. Recent redesign has now rendered it the worst app on my phone, until deleting it entirely. If you had it, trash it. If you don’t have it, don’t even think about trying it. A magical transformation from usability to utter and absolute garbage. Anyone involved in the redesign should be spat upon. Used to be my Go To movie app! Has been my only app for years for checking what comes out over the next few weeks. Now is useless for that. Time to find another app. Nothing worse than when “updates” are downgrades. They updated it and ruined the app. this used to be my go to app to find where and when movies for showing. Now he only showings that show are the ones Fandango is selling seats for. Meaning that matinees don’t show up. No information for local or Indy theaters. Having to go to each theaters sight separately. Time to find a new app. They also shut Down the portion of their site that used to have and play all my purchased movies. Very unsatisfactory. I’m pretty sure I’m seeing this apps last few breaths. I agree with many of the other reviews that they took a great, user friendly app with lots of features and turned it into a useless lump. It no longer has links to reviews, biographical information or any of the the other features that made it a valuable resource. Instead you even have difficulty figuring out what’s playing. The update was a giant step backwards and ruined a good thing. I'm a long time Flixster user to manage my "want to see" list and suffered years of a broken iPad UI (where the images associated with films would not appear). This new app fixes that. (Thank you!) But they’ve introduced a host of new bugs and problems. For example, now details of a movie frequently doesn’t show up. OMG, what’s the point of a movie app that can’t tell you about the movie. This is a serious bug that I hope they fix soon. Setting that aside, there are other issues, too. E.g., they've now replaced the "want to see" format from a grid-like "collection view" with a list-like "table view" list of movies. So, if I want to scroll through my lengthy list of movies on my wish list, I can see even fewer at a time than I used to be able to. On my huge iPad Pro in landscape mode (because I often have the cover stand/keyboard attached), I can see only four at a time with tons of white space right in the middle of the screen. That's nuts. Worse, when you go to your "want to see" list, it shows you 30+ movies (obviously, only by scrolling a lot because you can only see four at a time). If you want to see more, having scrolled to the bottom of the list, there's a "SHOW MORE" button at the bottom, which pushes horizontally to another rendition of the same limited list (except now I can see 5 at time; woo hoo!). But in this next screen, we're now presented with the exact same list of 30+ movies, (but now scrolled back up to the top of the list). So, you have to now scroll to the end of that list again and there's now a another "SHOW MORE" button. Fortunately, unlike the previous "SHOW MORE" button (which didn't show me anything more), this button does. But it only adds another 30 movies or so. And when you get to the bottom of the that expanded list, it stops and you have to tap "SHOW MORE" AGAIN! Wow, what a horrible UX. So, the bottom line is if you have (or might at some future point) have lots of movies in your "Want to See" list, this is not your app. What this app needs is a single, simple grid interface that automatically fetches more as you approach the end. This is not hard to do (it's "Collection View 101"), so please take a look a this. Y’all need to make it so people can’t put audience reviews in until AFTER the movie comes out. Also you should screen what people say. Cause some of it is very racist. It was my only app to track what to see! And what I watched! But now it became just useless that part not working properly anymore, movie news!!! What’s it!! Is it a news app???? What is the use of Theaters?? Fandango and Atoms do the thing don’t waste a tab! It is now so hard to add something to a list or rate! So bad! Latest version of the app is less intuitive and a lot less fun. Mandatory pop up ads are offensive. Featured movies on home page require you to click more than once to see other movies. Annoying. Should have left good enough alone. I am now using atom to buy tickets. It is seamlessly integrated with Apple Pay- hooray! I use IMDb for dvd and tv critic reviews. Much more user friendly. Goodbye Flixster. A good reviewing tool but when they removed the revenue earned. The expected movies on goes forward a few months, the old version was far superior. The new update completely ruined this app. This use to be one of my favorite and most used apps, now I am seriously contemplating deleting it which is very sad. The old version used to be very easy to navigate and was extremely useful. I am hoping they go back to the older version. This app is great in theory but in practice it does not work well at all. When I go to movies available at home and out the filter on Netflix, no movies show up. The problem is that there are hundreds on there but the filter just doesn’t work . Have to look it up by title and then when you go into that movie it shows available on Netflix. Kinda of useless. Use to look up movies on here for reviews. The search doesn’t work anymore. Search just comes back blank no matter what you search. Don’t understand what they did. This app used to be my go to guide for in theaters now and dvd at home. The new version is enigmatic at best. I could live with only being able to view it on its side on my iPad but I can’t find what’s new for rent at home as easily as before. It never ceases to amaze me how app developers continue to screw up what is working. Used to be a favorite app. No longer. I agree with everyone that the redesign in annoying and made it worse to navigate. But now the movie listings are consistently wrong or movies missing from theaters which makes the app worthless. Pretty much the worst cardinal sin of a movie listings app. I hope it goes back to what it was, but am at the point of deleting after using it for years. Don’t have any complaint that hasn’t already been stated by many people before. Was forced to update because of iOS11, and now what was a really well-designed app has been replaced by a flashy piece of garbage. Not only is it hard to navigate and find what you need among all the flash, the movie reviews that I enjoyed reading have all been truncated to just the initial paragraph. When will people learn to leave well enough alone. Now I have to find another movies app. Don't even bother downloading this app! it is no longer useful. This used to be one of my favorite apps. The latest update is quite frankly useless. I can’t find what movies that will be released that week on dvd. It’s a total waste of an app now. Why does it only open in landscape?